The other night we were cooking with leftover chicken. We often do this, and our go-to is quesadillas or fajitas, but the girls advised me they weren’t interested in Mexican. O-KAY. So here’s how I made Pesto Chicken Pasta. I chopped up the equivalent of about one pre-grilled/cooked chicken breast pretty small. 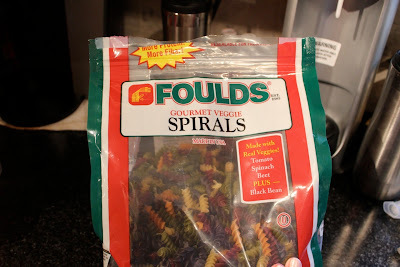 In the meantime, I boiled up some spiral pasta in salted water until it was my desired tenderness. 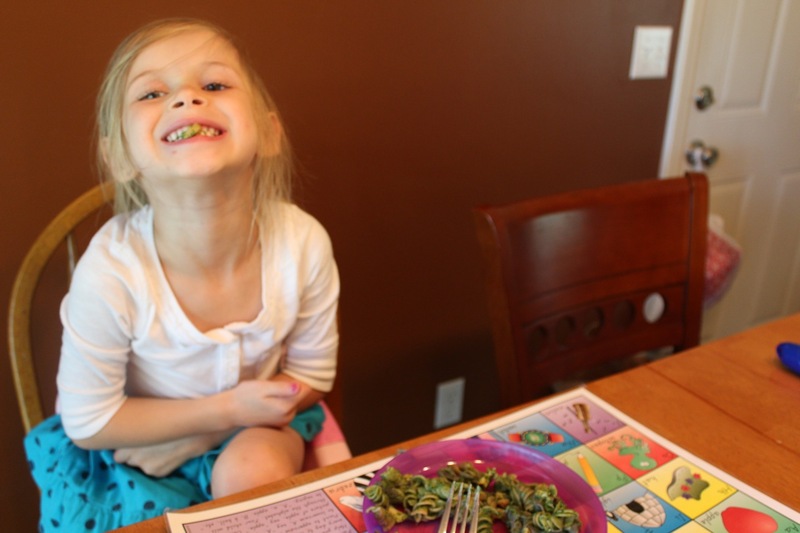 We prefer ours slightly past al dente. Once drained, stir with just a little olive oil and the chicken and set aside with lid on to keep warm. 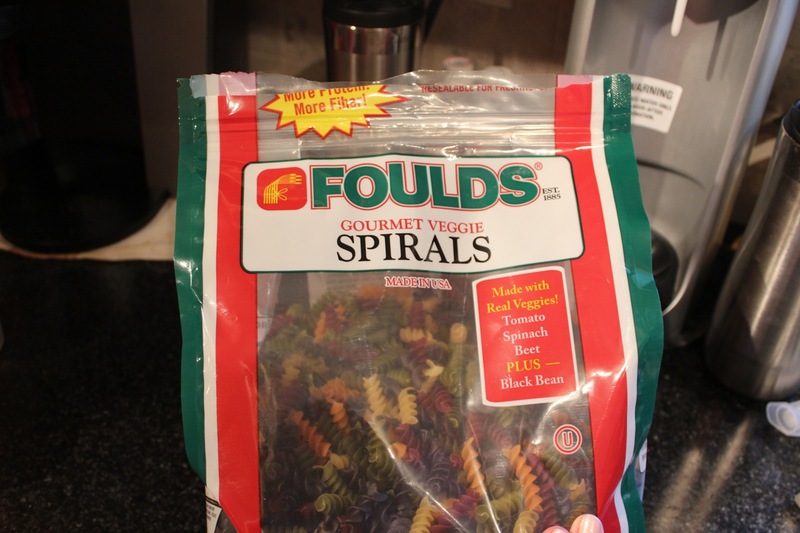 My pasta have sneaky veggies in them too. As the pasta boiled and greens cooled, I grated ½-1 cup of parmesan cheese (whatever kind you have is fine), measured out 2 T water and 2 T olive oil. 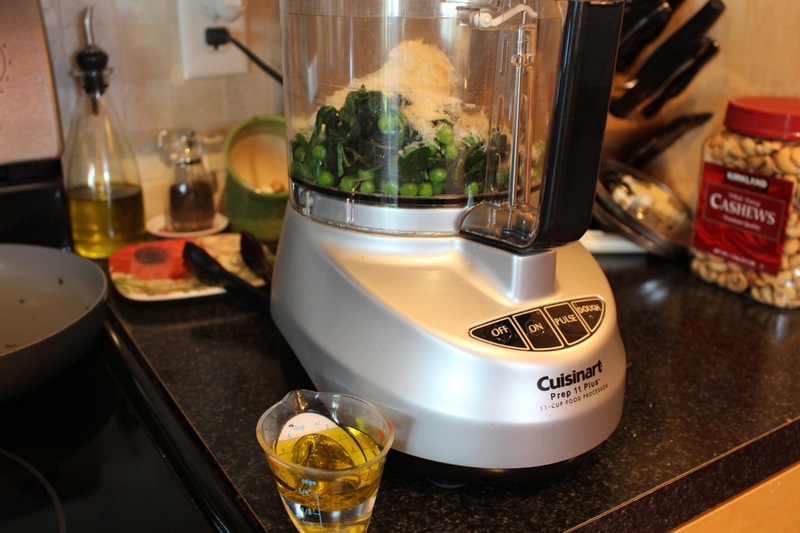 In my food processor, I placed the parmesan cheese, drained greens and ¼ t salt and pureed it. 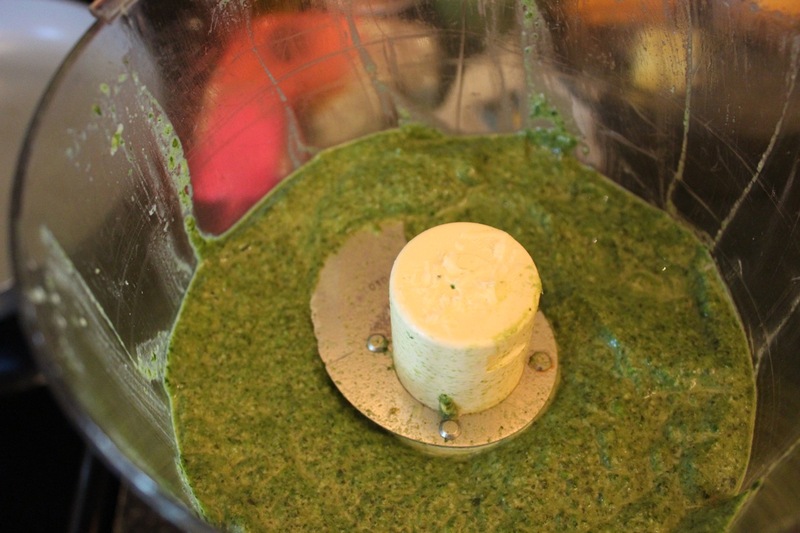 When the mix was smooth, I stopped, pushed down the sides with the spatula, started things up again and through the top of the lid, slowly poured in the water and olive oil. That’s it. Super easy. 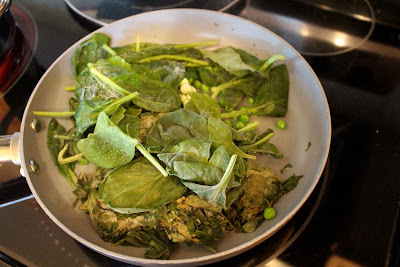 You couldn’t taste the spinach or peas at all. They pretty much just made the consistency right since I didn’t use pine nuts, which are what help with the consistency of traditional pesto sauce. (Good to know for anyone out there with nut allergy concerns.) Plus, of course, a sneaky vegetable! 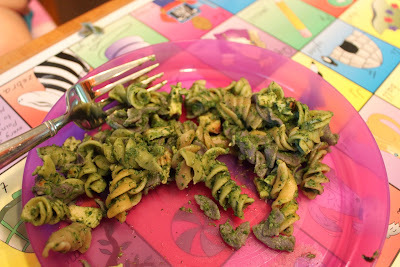 I did not use all of the pesto in my pasta dish. Probably ¾ of it. I just spooned it into my pasta and stirred it around until it tasted good. 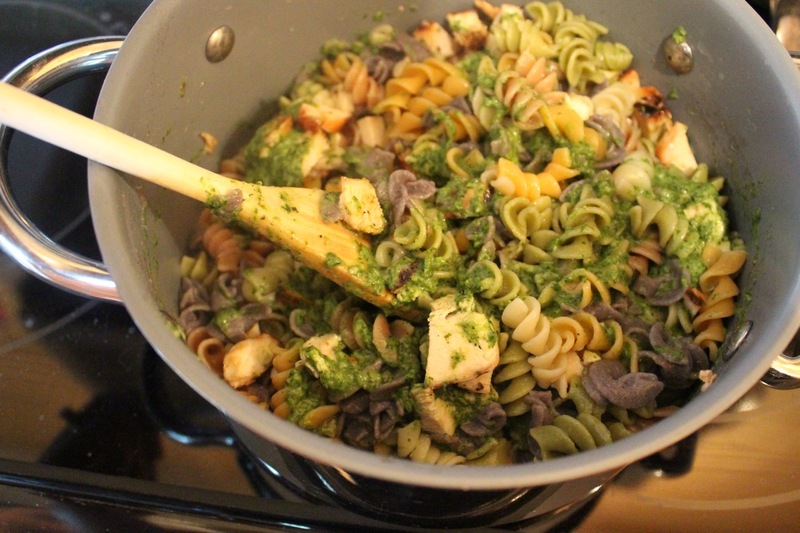 Then I put the lid back on the pasta pot and set the dish aside for a few more minutes to let the pesto warm up. 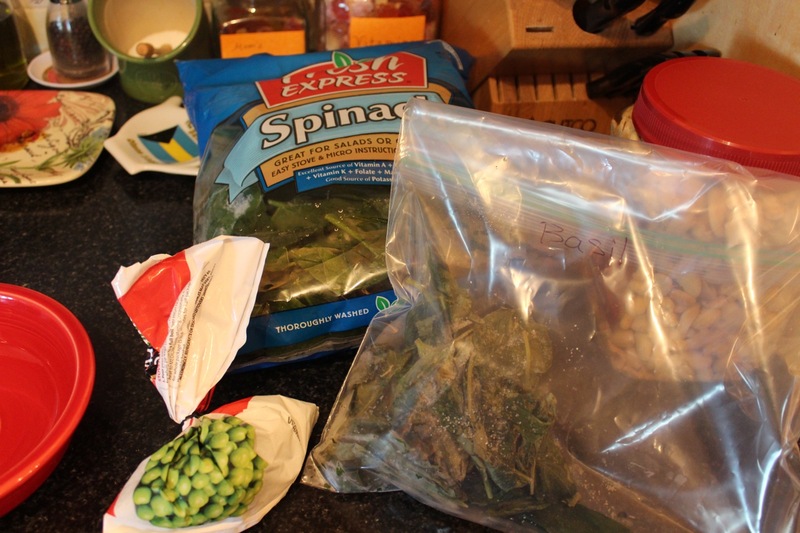 I refrigerated the rest of the pesto and plan to use it this week as pizza sauce. Yum!!!! KD's green grin of approval. The girls, particularly Easy Mac, thought this was EXCELLENT. I recall specific “oh my gosh’s” and “this is amazing’s”. Rock on crouton.